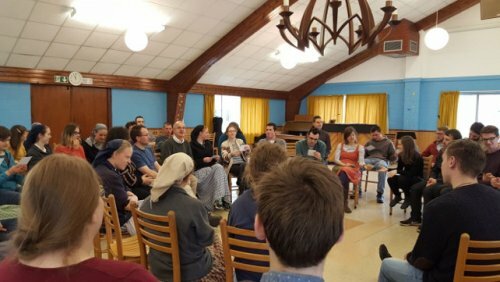 The Bruderhof Community at Darvell (West Sussex) welcomed 35 young adults from outside for the weekend of 9-11 March. We discovered about 300 people living a strong community life. Sharing all possessions. Rising early and working hard, and producing nearly all their own food. Frequently breaking into song, prayer and laughter at the communal meetings. See Caitlin’s report of the weekend on the Bruderhof website. When I signed up for the weekend a few months ago I had not heard about the Bruderhof before, so I wasn’t quite sure what to expect. There were several things about their way of living and their way of welcoming us that really made a strong impression on me. I will admit that for me as a liberal there were things about their way of living and beliefs that I found very difficult to understand and reconcile — and I am sure there were many things about me and my beliefs and way of living that they found very difficult to understand — however, at no point during the weekend did I feel judged in any way. I found the people there to be very welcoming and accepting. This made a very strong impression on me and made me think about how I welcome people I at first glance may not have that much in common with. The other thing that really stood out for me was the way they look after and include the elderly people living in their community. In the Bruderhof community everybody who does not live with their family gets “assigned” to a family that they become a part of: they eat together and turn to them for support and so on, and this includes older people as well, so they have someone who looks after them and help them. My host lived in the same community as her parents and they have an older lady assigned to their family whom they look after and I met her during breakfast one morning. It made an impression on me and I thought this was really lovely. I attend a local church where I live, and most people who go there are elderly and at times I feel like I don’t fit in, but I have somehow always felt like I belong there anyway and I think during this weekend I really saw how the Church, the followers of Christ, really all belong together like a family and that despite these perceived differences there is a deeper connection between Christians that unite everybody when we live with a common purpose. The evening prayer in Clydebank (Glasgow) turned out to be on the anniversary of the bombing in 1941 which largely destroyed the town. The prayer around the cross held in the modern church of St Margaret, entirely prepared by the young adult group of the parish, was attended by a good number of people of the town and students from Glasgow, as well as a couple who had come from the Isle of Arran! In the early 1980s several groups from Clydebank visited Taizé, and the friendship has now been rekindled. An evening of reflection and prayer with young adults of the Balham Vineyard Church (SW London) was held in the local community prayer room. Leaders of the African Prisons Project including Betty and Isaac, two senior Kenyan prison officers joined us. 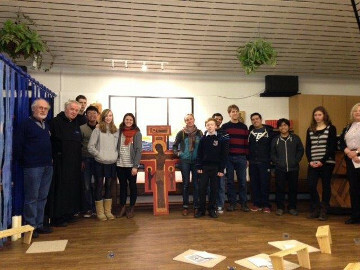 November: 2 volunteers from Taizé visited 18 secondary schools in England. A number of these schools are planning to participate in the National Church of England Schools Pilgrimage to Taizé, 15-22 July 2018, led by the Archbishop of York, John Sentamu. See a report of the meeting held in Birmingham, 28 April - 1 May. Nearly 300 people and a couple of high-school groups participated in the prayer at St James Piccadilly. Rev. Lucy Winkett, rector of the church, gave a meditation on Jesus’ meeting with Nicodemus (John 3). The prayer around the cross lasted long afterwards. Two brothers of the community were in Coventry to participate in the 2016 AASSH Conference for Church of England Secondary School Headteachers. 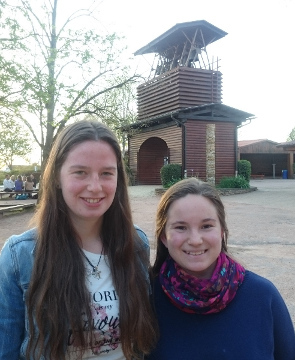 Anne Christin and Daniela, two of the long-stay volunteer team at Taizé spent 9-30 May in Birmingham as part of early preparations for the Hidden Treasure weekend there next year. The Carr’s Lane Community hosted a weekend titled The Courage of Mercy. Open to young adults (15 - 35 years old) with prayers in the style of the Taizé Community, shared meals, workshops and opportunities to discuss and reflect. 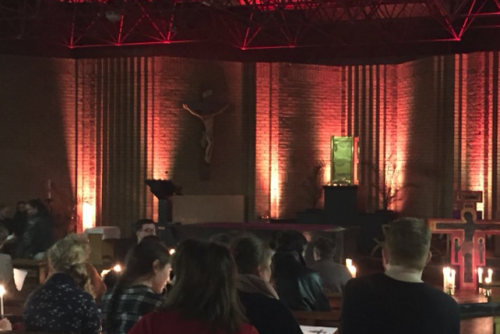 A prayer around the Cross at Oasis Church, Waterloo, on Friday evening, 4 March, at which Steve Chalke gave an address, was continued the next day with morning prayer and meetings for a group of young adults and students. The weekend was prepared in cooperation with the Student Christian Movement (SCM) and OASIS. In November, Pauline and Rebekka, two long-stay volunteers at Taizé made visits in England, mostly in North-East England and in the London area. They were welcomed on their arrival in London by the youth group of the Cherubim and Seraphim Church, Peckham, where they stayed for Sunday worship. During their journey they also stayed at the new Community of St George’s in East London, and with the Antioch Community, Acton (West London). They helped lead a youth group evening at Christ Church, Walker, Newcastle. And they stayed for a couple of days at the Emmaus Youth Village of the Diocese of Hexham and Newcastle. 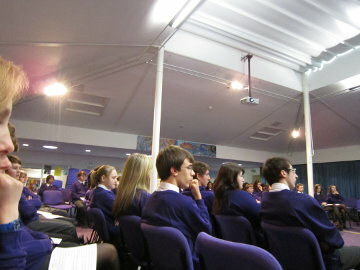 They visited 11 secondary schools for sessions with the GCSE and 6th-form students. “Mother Teresa claimed that there’s no such thing as a small act of love. Every act of love matters because it makes God’s presence known in the world. She said we’ve just ‘forgotten that we belong to each other.’ (...) It’s not the greatness of our faith that’s important but how we act on it. Jesus is clear that even the tiniest seed of faith will move mountains, will change everything, if we exercise it. Bernadette is a well-known hymn writer and during the prayer we sang an entirely new setting of Psalm 23 which she had composed in a style close to that of the meditative chants used in Taizé. The next day, a weekend meeting began in Edinburgh. Participants had travelled from all over Scotland, including the islands of Arran and Tiree, from several places in England, and there were even three young people who came directly from Poland. Those who needed overnight accommodation were matched up with Edinburgh hosts. I think we were all surprised just how much we managed to pack into the Saturday afternoon/evening. The ceilidh band, Flaming Nora, some of whose members had been volunteers at Taizé in the 1980s (! ), provided enjoyable instruction in the difficult art of Scottish country dancing for the last part of the evening. 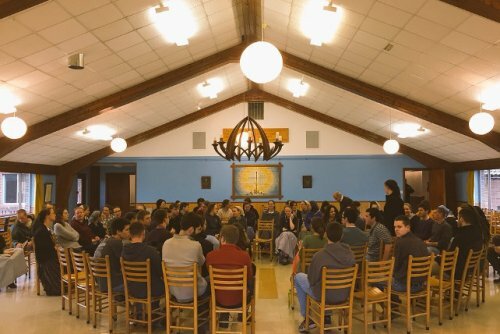 There were several meetings with groups of headteachers, chaplains and RE teachers — information and planning meetings for sending school groups to participate in the youth meetings in Taizé. This summer, thanks to a grant made by the Jerusalem Trust, two documentary makers will be coming to Taizé to make a film on the School and College Weeks. 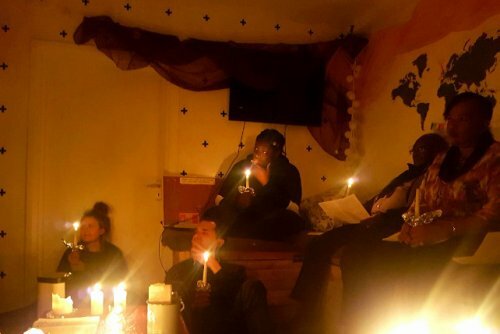 In Peckham Rye (South London), I met with the youth leaders of the Cherubim and Seraphim Pentecostal Church, who are planning to bring a group to Taizé in the summer. The church members are mainly ethnic Nigerians whether born in Britain or Nigeria. Hassan, one of the leaders, has already visited Taizé, but Matron Funke and Gabriel were surprised to hear that in Taizé many take off their shoes to come into church, and that the brothers are clothed in white, just as in their own church everyone takes off their shoes as a sign of respect for the sanctuary and puts on a white prayer gown! The day I visited, they were preparing a Friday night vigil to run from 10pm to 3am. Such a vigil is held each month. In Haringay (North London) a live-in community of just two, Johannes and Arvid, welcome around 20 refugees and asylum seekers in very simple conditions: mattresses on the floor of an old church hall. They receive support from people living in the area and are part of the network of Catholic Worker Houses of Hospitality founded by Dorothy Day. Another project working with refugees that I was able to visit was St Chad’s Sanctuary in Birmingham, which is the fruit of a cooperation between the Roman Catholic Church and the Salvation Army. 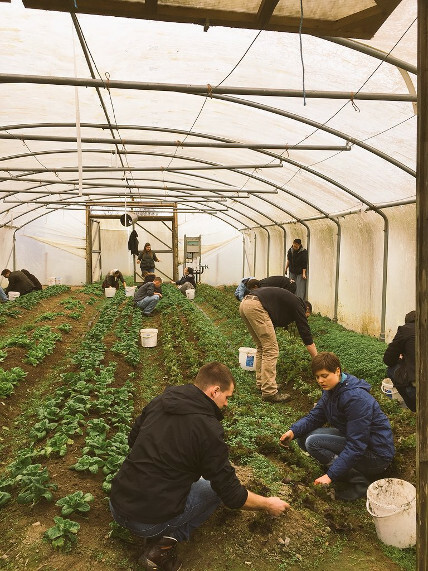 Some young people who have been to Taizé are part of the team of volunteers who teach English to around 70 refugees, asylum seekers and immigrants. In the class where I participated, the students were from Ethiopia, Eritrea, Yemen and Somalia. In November two young men who are long-stay volunteers at Taizé visited 22 schools in Britain intending to participate in the 2014 School and College Weeks. 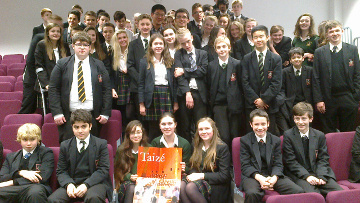 Once per half term, a ’Taizé evening’ is held at Cardinal Newman School in Hove. The first part of the evenings is for pupils from various local schools. It involves a meeting new people, making new friends and having a time of open discussion and sharing in small groups. The second part of the evening is for people of any age and we are often joined by a few people from local parishes. 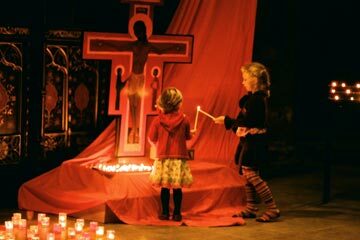 There is a time of prayer in the simple style for which Taizé is known. At the most recent evening the short bible passages was read by pupils in eight languages (Catalan, Shona, Chinese, Vietnamese, Polish, Spanish, French & English) – representing the richness of cultures and nationalities present. 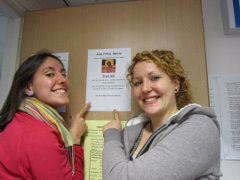 In March, two volunteers, Adeline (Germany) and Maria (Spain) travelled widely in England for two weeks. They visited 18 schools and took part in an evening prayer at the University of Bath. At the same time, a brother of the community was in Britain. Highlights of his journey were the evening prayers in Cambridge (St. Edmund’s Church), Norwich (Catholic Cathedral), Birmingham (Anglican Cathedral), York University and in London (Heythrop College, and in St Alban’s Church, Holborn). There were three meetings with headteachers / chaplains / school coordinators in Salisbury and in Birmingham to talk about the School and College Weeks at Taizé. Several new schools are planning to participate in 2013 and 2014. The Jerusalem Trust has offered a grant for a documentary film to be made of the School and College Weeks and this will be made in 2014. 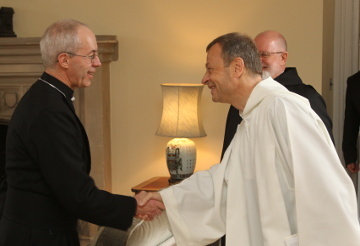 On 21 March, brother Alois came to Canterbury to participate in the inaugural service of Archbishop Justin Welby. Two pairs of volunteers from France and Germany, Lea and Maélis, then Alice and Miriam, made visits to 31 schools and 6th-form colleges which are hoping to participate in the 2013 School and College Weeks. Also in November, at the invitation of the Scottish Catholic Education Service, two young people presented the international meetings at Taizé to the Conference of Scottish Catholic Secondary School Headteachers in Edinburgh. My 10-day journey in England began at Canterbury Christ Church University. The university was originally built as a Church teacher-training college, and the chapel is one of the central buildings. When I arrived, the chaplain and a few students and staff were there, in the middle of daily morning prayer. In 2010 more than 21,000 eighteen year olds in England took the Religious Studies A-level (school-leaving exam) – a 50% increase over 5 years. At the meeting with students who are training to become teachers of the subject, we spoke first about the common misconception is that to “be religious” is like climbing into a box which filters your experience of the world, as if you are not really open to life because you have accepted a set of pre-defined answers with which to respond to the situations you encounter. When we realise that life is not something we can observe from outside as if we were disembodied, but rather that we are part of something much greater, then a religious outlook becomes possible. From that moment a kind of receptivity becomes basic in our outlook. For the Bible, we could even say that this is the fundamental world-view: God takes the initiative, we are responding beings before we are initiators. After a presentation of the young adult meetings at Taizé, we were invited to gather for a midday prayer in the chapel. To our surprise more than 60 came to this quite long lunchtime prayer. The meeting in Canterbury proved to be a good preparation for the following weekend when I participated in a conference for Religious Studies teachers. 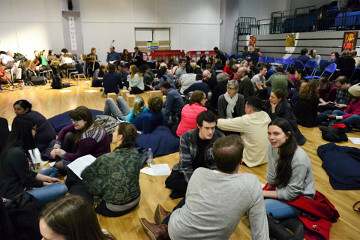 The organisers had asked for workshops about the international youth meetings at Taizé to be included in the programme. Teachers of Religious Studies in schools may be Christians, or of other faiths or not profess any faith, but for the subject it is important for religion not to be thought of as a system of ready-made answers. The subject is partly a study of different faith communities, their practice and history, but it also encourages students to consider the “big questions” of life – a phrase that I heard several times. 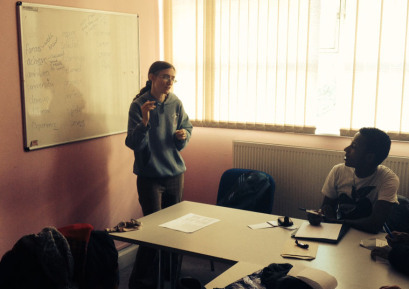 A week later in Manchester there was a gathering for students organised jointly with the Student Christian Movement. Brother Alois’ question in the Letter from China, “What are you doing with your freedom?” set the theme for the whole weekend and similar questions arose again: recently, in Westminster Cathedral, pope Benedict said, “One of the greatest challenges facing us today is how to speak convincingly of the wisdom and liberating power of God’s word to a world which all too often sees the Gospel as a constriction of human freedom (...)” This challenge is perhaps not just about how we tell others, it is also often difficult for us to sense that faith gives us freedom. As we face our inner questioning, and the choices we need to make, the thought may sometimes cross our mind: If only I didn’t have all these questions, hesitations – wouldn’t my life be less complicated, wouldn’t I be happier? But let us never regret the questioning and searching we have! It is a gift, not a problem. It may mean that life is difficult, but it is only with that searching inside that life can ever become beautiful and meaningful. In Bristol it was fascinating to see the way in which chaplains in the multi-faith university chaplaincy cooperate. Soon after the daily 5 pm Christian prayer, the same room was being used for a meeting of Hindu students. In Bath, Keele and Durham there were also evening prayers with students. 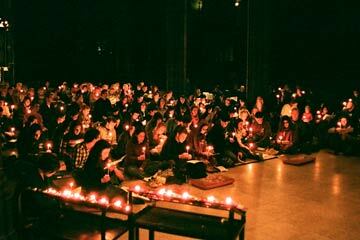 In Keele, the 10 pm night prayer was part of a week organised by the chaplains to invite students to use the university chapel, which stands right in the middle of the campus. The whole week was possible because of the unusual degree of friendship and cooperation which has been built between the various Christian groups in the university. In Durham the idea was to hold a mini-retreat involving not only an evening prayer, but a talk on the disciples’ request to Jesus, “Lord, teach us to pray”, and then a prayer followed by breakfast the next day. 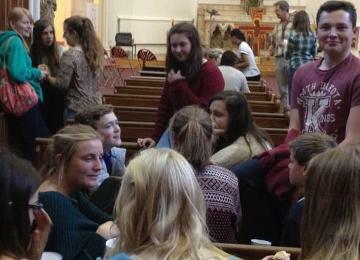 Everyone was surprised, I think, when a good number of students were in the church for the 8 am morning prayer! 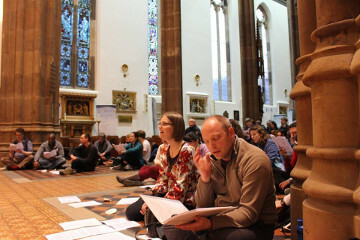 The high point of the Manchester weekend was the Saturday evening prayer in Manchester Cathedral, where the staff welcomed us warmly and let us search everywhere in the building to collect kneelers, cushions, rugs, and prayer stools. They were all used! Around 250 people participated in the prayer. One of the university chaplains gave a bible meditation on the words of St Paul to Timothy: “I remind you to rekindle the gift of God (...) for God did not give us a spirit of timidity, but rather a spirit of power and of love and of self-control.” This short reading was read in a dozen languages by the students participating in the weekend. On the Sunday morning there was a short “forum” time when Grace from Ghana, Nebojša from Serbia and Ramail from Pakistan, now all students in England, shared experiences and thought from their countries. Then Anna, a young artist from London, who had led the creative workshop the day before on the theme “the responsibility to enjoy the world” introduced us to some questions linking faith and art. Later that morning the Sunday morning eucharist was celebrated in Mandarin and English in St Peter’s Chaplaincy.